← You say middle. I say center. That was gut- wrenching and lovely. Beautiful! Lot’s of lovely sweet layers to this one. Happy thoughts to you and your family. Chocolate soothes everything, doesn’t it? It does. But for me, ice cream soothes it better. Beautiful writing. 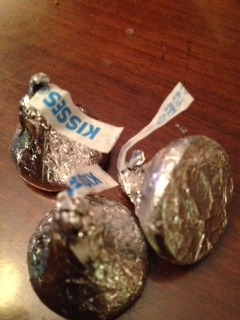 I’d like to think that the chocolate kiss was a sensory memory for your Husband’s Aunt – maybe a before-bed treat? I think that’s a beautiful thought. I hope so. It is, so I can sympathize with this and know how hard it can be. Hahaha! I hate it when you get dizzy and fall over…. i started eating ice cream very early today.. it’s that kind of day. Oh, man….I’ll keep you in my thoughts. never underestimate the power of chocolate. I love the image of her sitting there turning the foil over–nice work! painful. beautiful. necessary. and yes, sugar soothes. on me, it also jiggles and wobbles. That sweetness is definitely the momentary cure for what ails you. This is such a beautiful piece. “The last bits of patience dissolving in my mouth,” what a wonderful use of foreshadow and how beautifully you tied these two stories together with sweet chocolate. So well crafted. I’m glad the chocolate could soothe. I hate when the stress is so high it catches in your throat. Very sad and lovely – thanks for sharing. And kudos on the well-deserved kudos! Such a great introspective post. It’s such a hard experience on everyone when our loved ones aren’t themselves. I’m sorry you and your family are going through this. This is very sweet (get it, ha!). Now, I want chocolate. This is beautifully written. I love the connections you draw between you, your father, your husband’s aunt, and the chocolate. Very well done.